Mangaluru, Oct 11, 2016: October is the month dedicated to the welfare and concern of elder citizens all over the world. 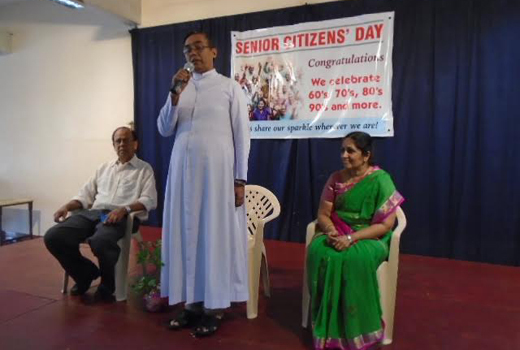 Milagres Senior Citizens Association in keeping with their social responsibility and human concern, held a programme to enthuse and reassure the elders of the parish and generally. This humanitarian group on October 10 in an exemplary manner held a ’celebration of age’ to convey a message that ’Age in a number and all depends on you to keep moving ahead in health and happiness’. A clock near the podium proclaimed "Don’t watch the clock...Be like it move on tic toc". 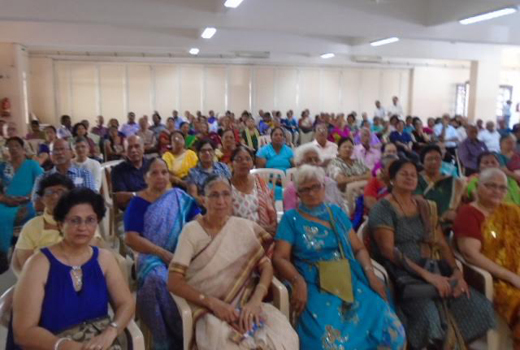 The programme got off to a good start at 10.30 am at Milagres senate hall with more than 200 elders present, the majority and more enterprising were women, all present derived great encouragement and inspiration out of this programme. It has been a regular practice of this association through its members and well wishers to look into the welfare of elders and the deserving in many possible domains. Starting with calling upon God who is the Supreme carer of all, the day was well timed with games, skits, songs, talks, information and welcome fellowship. Exchanges to enhance the day to day lives of Senior Citizens who these days are forced to live in isolation away from their children and close ones. Mangaluru is indeed fortunate that there are caring groups and individuals to enhance the life of of those in their sun set years. The parish priest of Milagres Rev Valerian D’souza also visited the event and blessed the occasion. 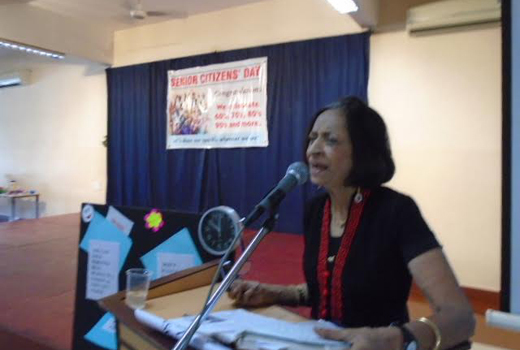 Chief Guest was Dr Prabha Adhikari, HoD, Yenepoya Medical College. The good doctor who has spearheaded services for the elders in the city for long, gave a constructive talk for wellness and peace in old age. Peter Oswald gave a talk on the Rights of Senior Citizens and distributed hand-outs to reinforce the information needed. 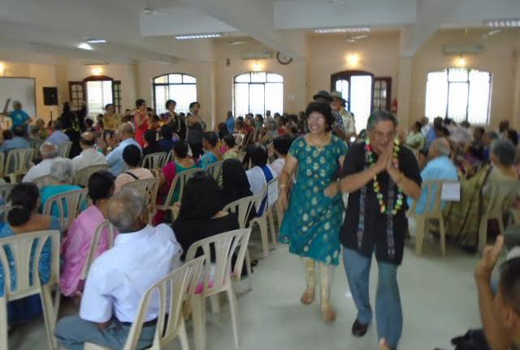 The Senior Citizen’s Associations of Bendore, Angelore and Milagres provided delightful Cultural programmes on the day. Pictures here will speak volumes on this lovely occasion. The event was appreciated by each and every participant, well organised and promoted by Office-bearers of the association, Winston D’Souza-President; Zita Farias-Secretary, Rene Correa-Tresurer and volunteers with Patsy Lobo their leader. The sponsors of various contributions were : Archie Menezes; Titus Noronha-Rahul Advertisers; Ajit Gonsalves from Far East Agencies; Acacia Woods & Furniture; Mark Saldanha; Achal Industries, Jane D’Souza and several volunteers made this celebration a memorable one for 2016. 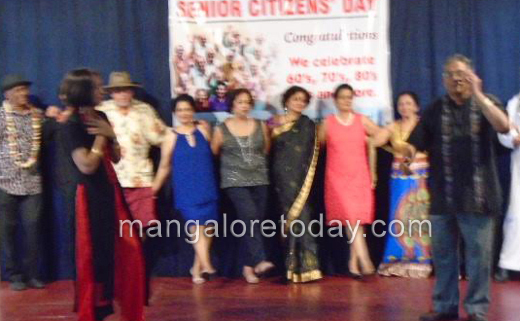 There is much that is done for the senior citizens behind the scenes on a day to day basis by several in this group which is a laudable effort indeed .and has plans to take matters forward. 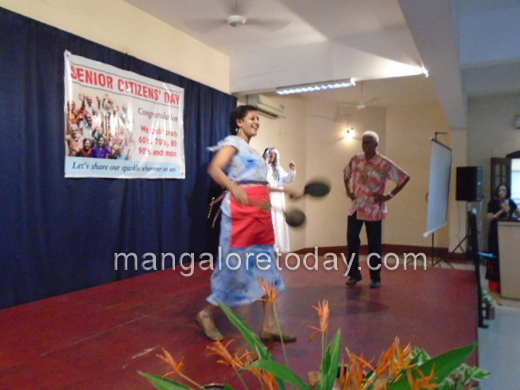 The ever enthusiastic social activist, Patsy Lobo compered and choreographed a Senior Citizen’s Fashion Show, Dances titled ’The Bold & the Beautiful-Down Memory lane’. It was evident that the organisers and participants all had a good time that is refreshing in this life on earth whether you are old or young. The aged must always be a part of life.